As an Amish community sets off for the New World in 1737 to find a place free from religious persecution, Anna König has to go along because she is the only one who knows English. She has heard all of the horror stories surrounding voyages across the Atlantic, along with the challenges in the New World. She is set on returning home if she survives. The Charming Nancy‘s ship’s carpenter, Bairn, is weary to be taking on more passengers made up of “Peculiars”. He would much rather have more cargo than passengers overloading his ship. Although he’s built bunks in the lower deck for their guests, he is convinced that something bad will happen on the voyage. When Bairn and Anna meet, he can’t stop thinking about her. She is different and mesmerizing. She is all wrong for him and his lifestyle, but he can’t stop finding ways to interact with her. Even after he is warned to stop associating with her, he can’t seem to help himself especially when Anna starts seeking him out. Will Bairn be able to help Anna when she needs it most? Can Anna help Bairn find his faith? Will the ship make it safely to the New World? What surprises await Bairn and Anna as they fall in love? I’ve only read one other book by the author, but I really enjoyed reading about Anna and her journey. 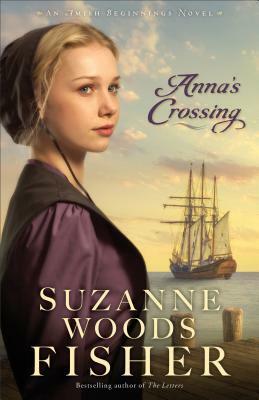 I was not familiar with the struggles that the Amish went through when they immigrated to the New World, but I was impressed with all the author researched in order to write such great historical fiction. There’s a special place in my heart for Amish fiction and I really liked the intricate story. Her characters are so endearing and I absolutely adored the different relationships in the story. I recommend this book for any fans of Amish romance and historical fiction.